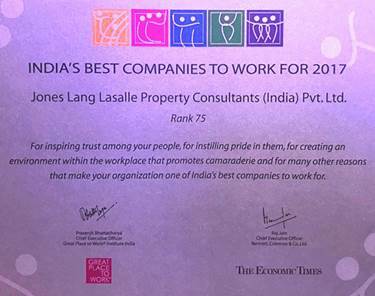 Leading international property consultancy JLL has been recognized as one of the Best Workplaces in India 2017 in the annual survey of ‘India’s Best Companies to Work For’ - a joint study conducted by Great Place to Work® and The Economic Times which was first launched in 2008. In the list of ‘India’s Best Companies to Work For 2017’, 100 organizations from around 20 major industries were recognized as the best workplaces. As part of the evaluation, JLL was measured against parameters like trust, pride and camaraderie prevalent in the organization through the Trust Index©, a proprietary employee survey tool developed by the Institute. All participating companies were evaluated on the basis of their employees' responses to the survey and scored accordingly. Thus, the objective assessment of an organization’s people practices and employee experiences helps in identifying the best workplaces in the country. In India, real estate is the second-largest employer after agriculture and its people growth is slated to grow at 30% over the next decade. JLL India, too, has grown by 30% year-on-year for the last two years. With real estate services getting more organized, influx of the right talent is key to help shift gears. This highly prominent accolade reaffirms the fact that JLL’s roadmap to Achieve Ambitions is not a mere plan but a journey that is well underway. A Culture of Communication - JLL’s quantum of hiring, constantly shrinking attrition rate and the number of ‘boomerangs’ speak volumes of the culture and organizational commitment that the Firm proudly stands for. At JLL, employees are considered the Firm’s biggest strength, and effective communication plays a vital role in nurturing them. For this reason, open communication even before hiring is confirmed on paper, immediate grievance handling for employees, up and down mentorship and talent mobility have found their place in the system. Collaboration and accessibility to the leadership are cited as key engaging factors among JLL’s long-standing employees. In order to build a business which runs across a wide gamut of services, it is essential to develop a work force that brings diverse views and increased innovation through varied backgrounds. JLL’s diversity initiative follows the 3G approach - Gender, Generation and Geography. The Firm’s overarching strategy is to ensure influx of and long-term careers for women. At JLL, women employees benefit from a completely inclusive and enabling environment, which makes them feel protected and helps them thrive. JLL also actively identifies and recruits ex-servicemen, both to honour their service to the nation and to utilize their unique training and capabilities to bring professionalism to the real estate segment. JLL also employs a differently-abled workforce across multiple client sites and data analytics functions. JLL actively encourages and supports a healthy balance between work and family life, and also provides a number of avenues for staff to de-stress and improve their quality of life. Also, the Firm has a well-defined ethic of giving back to society, and aligns its social and environmental activities with its business purpose and values. Each business line is encouraged to include social and environmental initiatives as a part of their business strategy. With these initiatives, JLL became the first services company within the real estate sector to have imbibed and implemented CSR as a part of the business agenda. In recent years, there has been a significant shift in the approach and hiring practices at JLL. The certainly fulcrum remains attraction, retention and growing a workforce that is attuned to the Firm’s culture. However, there is also considerable investment into new techniques and methods to keep the Firm abreast with the changing times and wired into the latest disruptive innovations in people management. JLL liberally leverages technology in the hiring processes to ensure and consistent, cutting-edge repository of suitable candidates. The nature of the real estate services industry demands a round-the-clock availability of adequate talent for the Firm’s clients, and technology plays a key role in tracking, hiring and deploying the right talent at the right time, in the right place. JLL was ranked as one of the Top 40 most attractive employers globally in LinkedIn’s first-ever study of ‘Where the World Wants to Work Now’, and became the first real estate services firm to make a decisive mark in this survey which collated data from over 433 million LinkedIn members. At the end of the first quarter of 2017, JLL had nearly 300 corporate offices, operations in over 80 countries and a global workforce of more than 78,000. As of March 31, 2017, LaSalle Investment Management had $58.0 billion of real estate under asset management. JLL is the brand name, and a registered trademark, of Jones Lang LaSalle Incorporated. The institute serves businesses, non-profits and government agencies in over 54 countries on all six continents and have conducted pioneering research on the characteristics of great workplaces for over 25 years. Every year, they partner with more than 8000 organizations around the world to help create and sustain a High-Trust, High-Performance Culture™.